SKU: Book#26. Category: Western eBooks. The Hunt For Old Mose © 2017 by Raymond Cook is a 268-page story about the most terrifying grizzly bear roaming central Colorado in 1883. The bear was nick-named old mose after a rancher saw it moseying away from an elk it had killed and eaten. The fact was Old Mose was actually a five-year-old sow with two claws missing off her left hind foot. 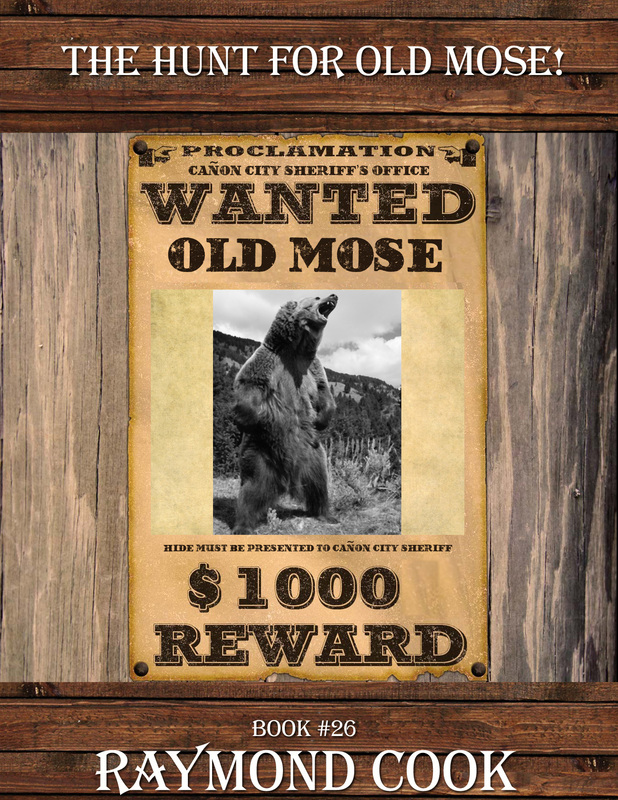 Old Mose was a ferocious bear who roamed a huge area near Canon City. Standing nearly 9 feet tall, weighing 1,200 pounds with 4-inch claws and 3-inch fangs she reigned supreme. Ranchers depended on their gardens and the livestock they raised both as a food source and to sell to earn money. 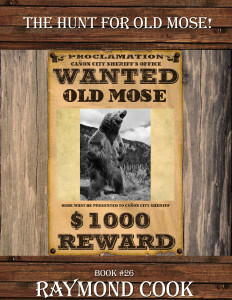 When the massive grizzly began destroying gardens and killing cattle a $500 bounty was put on old mose’s head. Carcasses of livestock also attracted wolves, mountain lion, coyotes and black bear which endangered families. The Colt 45 revolver or Winchester 30-30 rifle couldn’t kill a grizzly bear. Only a Marlin 45-70 or similar rifle with a 300-grain caliber shell could kill such a large bear with a well-placed shot. Barbwire fences barn doors and hog pens did nothing to keep the bear out. With thousands of families homesteading and prospectors panning for gold or silver in Central Colorado, there were plenty of horses and cattle to kill. Frank Pigg and his 16-year-old son Wharton found gold in a nearby stream on their land. After Frank is killed by Old Mose, Wharton vows revenge. He sold his father’s mine, bought a ranch in a remote valley and set out to track down and kill the fearsome grizzly. But Old Mose was cunning and eluded Wharton and other hunters for more than twenty years before the final confrontation in 1904. 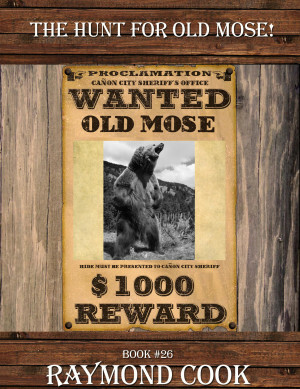 Take a trip back in time to central Colorado where Old Mose was king of the Grizzlies. For every living creature in the wilderness, life and death played a deadly dance of opportunities and bad luck. As for Frank and his son, Wharton was learning how to pan for gold from his pa. But panning for gold came with a price, and that price was back pain from being bent over holding the pan. A month had passed since the grizzly bear attack south of town. It was late July, and even though the two men held their pans under the shade of trees in the stream, the day was hot. A chair set nearby with Frank’s 45-70 rifle leaning against it. But as the men worked their way up the stream, the chair got farther and farther away from them. When men are panning for gold, they spend most of the time looking down at the pan, with gravel and water swirling around then looking around for their safety. This mistake would cost Frank his life, and almost his son’s life, too. By the time Old Mose’s huge front paw snapped a dry branch on the ground, he was forty feet away from both men. Far too close for either man to make it to the rifle next to the chair. Frank saw the bear make its run towards them first, and yelled to his son, “Grizzly bear! Run for the cabin, son!” When Wharton saw the bear too, he was terrified. There wasn’t any time to look to see where the chair and rifle were. Wanting to give his son a chance to live, he ran to his right, hoping the bear would chase him, and not his son. The last words yelled by Frank were, “I love you, son. Run, and save yourself!” Wharton unhooked the string over his revolver before he made a run for the chair. But as he tripped, and fell, his revolver fell out of its holster. As he heard his father’s screams as Old Mose caught up to him, he got to his feet, and ran towards the cabin, with his heart pounding. One look over his shoulder and he saw Old Mose coming for him now. Realizing he’d never make it to the cabin door in time, he ran for the ladder leaning against the back cabin wall. He barely reached the roof before Old Mose knocked the ladder over with his body. The bear was standing up now growling, and the sounds Wharton heard terrified him. Quickly, his right hand reached down to draw his gun. He was going to shoot the bear in the face six times. When he didn’t feel the handle, he looked down and saw his holster was empty. There he was, trapped on the roof of the cabin, with the most enormous grizzly wanting to kill him too. Old Mose was furious the boy made it to safety. Seeing no way to get at him, the bear dropped to all fours, walked about twenty-five feet away and lay down. It had patience and all the time in the world. An ice-cold stare from Old Mose’s eyes told him, ‘You do just that. I’ll be waiting for you, and I’ll eat you too!’ After setting down, and staring at the boy, Old Mose finally stood up and lumbered off. Wharton was no fool, not by a long shot. Old Mose could be patiently waiting for him to jump to the ground. Doing that risked spraining his ankle. What chance would he have to reach the front of the cabin, latch it, and put the boards up before the bear smashed down the door? The only rifles inside the cabin to defend himself with were his 22 rifle and 30-30 rifle. Neither of them would kill the bear. Wharton never took out his pocket watch to see how long the bear had been gone. Finally, he decided to risk it and, jump to the ground. But it was ten feet to the ground, and no matter how often the boy tried to make himself jump, he couldn’t do it. Finally, he scooted to the edge and jumped. He hit the ground hard but didn’t hurt himself, and he was on his feet quickly. He ran to the front of the cabin, pushed the door open, slammed it shut, latched it, and put two heavy boards across the door. With his heart pounding and his heart feeling it would burst out of his chest, the boy took deep breaths. As he calmed down, he looked around and saw his pa’s Winchester lying on his bed. He went to the bed and picked it up. A lot of good the rifle would do him, he thought angrily. He had to go back outside, and search for his Colt he’d dropped. He also had to go further away from the safety of the cabin, to bring back his father’s 45-70 rifle. If Old Mose was still nearby, he’d die the same way his father died. Suddenly, he went to the door, took down the boards, unlatched the door, and pushed it open. Gripping the Winchester rifle with both hands, he leaned his head out first, eager to slam the door shut, if he saw the bear. Now, he was standing at the edge of the cabin. As he looked around the corner, he didn’t see the bear. He couldn’t see where his revolver was or his father’s body. All he saw was the tipped over chair and knew the rifle was close by. That was where he’d run to first. Getting his hands on that rifle might save his life if he had time to get off two or three shots. He’d look for his Colt on the way back to the cabin. Sweat was pouring down his forehead. He didn’t know if it was because he was scared to death, or because the afternoon was so hot. He wiped his brow with the sleeve of his shirt and took off. He ran like the devil wanted to take his soul. When he reached the chair, frantically, he looked on the ground for the more powerful rifle. The moment he saw it, he threw down the Winchester and picked up his pa’s rifle. He gripped the rifle tightly and pulled back the hammer. The rifle he was holding was supposed now, was to save their lives. But a rifle or pistol can only save a man’s life if he’s holding onto it. Wharton knew his father had run away from him to give him a chance to live. He looked at the ground nearby, and his eyes moved slowly, farther and farther away, until he saw what was left of his pa. The moment he saw his body, tears flowed down his cheeks. With another look around, he laid his father’s gun belt over his left shoulder, went back, and picked up the Winchester rifle. On his way back to the cabin, he picked up the pistol he dropped when he fell and put it back in his holster. Then he walked backward slowly to the cabin. After he was inside, he latched the door and put both heavy boards across the doorframe. Then he went to the table and laid both rifles, and the gun belt down. He took out his father’s pocket watch, and wallet, and set them on the table. He picked up the watch, and chain, and opened the watch. On the left side was a small photograph of his mother and father. The pocket watch was his now, and it would be the one thing that would remind him most of his parents. Blood was on his pa’s gun belt, and he went over to where a bucket of water set on the floor, beside the cook stove. He paused long enough to pick up a washcloth and returned to his chair. After he set down, he looked around. The cabin felt empty without his father now. He set the revolver down on the table and cleaned the gun belt first. Then he slid out the shells on the back of the belt and cleaned them too. As he picked up the 45-70 rifle, he held it in his left hand with the buttplate resting on his knee. In a few minutes, it too was clean. The last thing he did was take out his Colt, and wipe it down too. He planned on riding into town to tell the sheriff his pa was killed by Old Mose. But first, he’d grab a shovel, and bury his father. He had a heavy heart when he walked out the door carrying the powerful rifle. He grabbed a shovel leaning against the cabin wall and headed over to where his father’s body lay. He brought the chair to where he’d dig the grave. He laid the rifle across the chair. Then he put the tip of the shovel on the ground, took a deep breath, and stomped hard. By the time he was finished digging the grave, Wharton had sweat on his brow. He took a handkerchief out of his back pocket and wiped the sweat off. Only one thing is harder than burying kin, and it’s having to hold onto part of their body. When the grave was filled, he set the shovel back against the cabin wall where he found it. He saddled his horse, locked the shelter to protect the other horse that was his now. He slid the 45-70 rifle into the rifle scabbard and rode down the mountain. 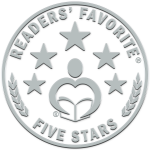 Reader’s Favorite Book Review, March 14, 2018 by Gisela Dixon. The Hunt For Old Mose is written in a fast-paced style and although, at first glance, the plot might seem simple enough, Raymond Cook’s telling of it, with all of the small details of life of people in Colorado, the descriptions of the landscape and mountains, the day-to-day life of a homesteader or a prospector really add depth and richness to the novel. The actual descriptions of Old Mose, grizzly bear attacks, and of wildlife in general such as coyotes, wolves, mountain lions – and how each of them fits into the ecosystem is very interesting and I could almost imagine myself in Colorado, living during those times. This is a great book and anyone who enjoys the Wild West genre or just novels based on true historical stories will surely enjoy this book. The Hunt For Old Mose is my newest 2017 action-packed western frontier eBook. This eBook was uploaded onto Amazon on January 1, 2017. I’ve made this comment section so I can share with visitors to my website what readers feel about this particular eBook. To share your comments too, just go back up to the top of the page and click on the Contact Me tab. Samuel Mejorado, January 23, 2017 This was an amazing adventure!!! Great storytelling yet again by one of my favorite authors. The story just builds into a high tension and riveting ending. With fact and history written all over it. Can’t wait for his next book.